This Modern is one of my favorites to despite the use of angular lines. I normally like smoother lines but this piece has a great esthetic balance. 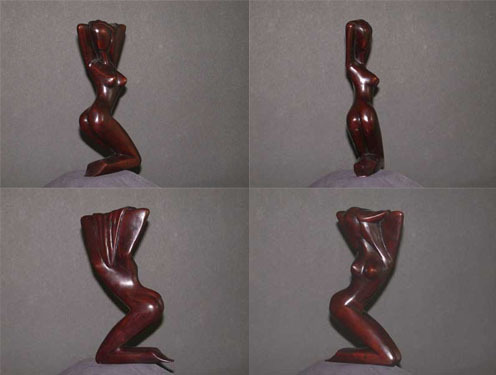 The natural in the resin gives it the deep, rich color of bronze. It is very nice to touch because of the balance and smoothness. She is 8 tall and the base is very smooth and we cover with heavy velvet. Artistically crafted, this is a beautiful and unusual piece. Appropriate in the finest home, this is a rare find and a real beauty.